Keywords are a powerful tool for search engine optimization that help enhance ebook sales for publishers and retailers. However, the power of keywords has never been realised, for some reasons publishers have never really used keywords on the metadata of their ebooks. An estimate says that around less than 20% of publishers have experimented with keywords, and that too not in a planned manner. 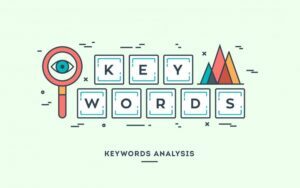 Keywords are a piece of metadata which help in search engine optimization (SEO), and can solely boost the visibility of an ebook in search ranking, hence directly multiplying the number of sales. Keywords are basically words or phrases entered into the metadata of the book, along with title, author name, book description, published date, ISBN and other information that create a unique online sales identity for the item. These keywords, which are usually a set of 5-10 are taken from the content of the book and should be able to reproduce some basic information about the book when combined together. We make a list of keywords that are most relevant with the content of the book, but this is not the final list we use. Finding the right set of keywords for metadata is not as simple as collating a list of most relevant words from the content. People who search online for books will not enter the keywords on the search engine which would be similar to the keywords you have chosen. To look into how consumers are searching for a particular category of books online, the simplest way is to do the search by yourself and observe the search engine’s suggestion, this gives an insight on the current trend of searches. Real readers use casual words instead of heavy ones, e.g., a gripping tale of homicide would be commonly searched as a ‘murder mystery’. Another way of finding common keywords is to look at social reviews. Goodreads is the top online book review platform, besides we can also scan other popular social sites like twitter for reader opinions, this helps us in understanding the reader’s view and the language and terms they use frequently, which is casual, honest and authentic. All these exercises will give us a crude information on the most common terms used online to search for a particular book or genre. After this we make a concoction of keywords from the two sources, the first source being the list which we created from the book. The final list of keywords should have an equal weightage from both the lists, the first list consists of keywords deeply relevant with the book’s content, and the second list consists of keywords used by readers to find the content. So the final list should be a hybrid of both. The next step is settling-in the keywords into the book’s product page and testing their competency afterwards. Testing the competency is an exercise similar to finding the common search terms on search engines. We perform the search (in our retail portal or Amazon, iBookstore, or Google Play) using the keywords we have integrated into the product page and observe the result to see where our product lies. It usually takes time to bear the fruit of any SEO exercise, it may take months. The big online retailers have their own algorithm of keywords against which they compare our list of keywords. SEO is an exercise which takes a lot of patience. Along with SEO, publishers can also promote their ebooks through social media and blogs, which again help increasing the credibility of the ebook in the eye of the search engines. In the battle of content discovery consistency and authenticity is the key, we continually monitor the performance of the product and optimize the metadata, and also keep the chatter live about the product on internet.